Though (as a whole) we’re a little late to the party, Christians in large numbers, are starting to notice that food matters to God. Rick Warren is challenging his church and the Church at large to stop supporting gluttony as the last acceptable sin. I’m going to a “Tasty Conference for the Hungry” next week hosted by the Vision Forum on the Reformation of Food & the Family. And cutting edge farmer, Joel Salatin, who has been all over indie food films like Food, Inc. and Fresh, is the new Wendell Berry, getting food and farming inspiration from observing God’s creation. So here’s hoping that Christians can start becoming a bigger player in the practice and dialogue of bodily stewardship, food justice, and the abolition of gluttony. Luke and I just wanted to take this opportunity to share our feedback with you regarding the retreat this weekend. We were so thrilled to finally be able to make it back to a family retreat after missing them for the last 4 years. The conference center was beautiful and hospitable. We loved the “lite” schedule, affording us time to relax, hang out with old friends, and meet new ones. Melissa and Karen did a wonderful job organizing and we were so grateful for those who volunteered their retreat time to hang out with our kids so that we could have uninterrupted conversations (a rare treat). Our kids had a blast and it goes without saying that the revue show lived up to the hype. We’ve already got a skit in mind for next year! There was one “food for thought” item (foreshadowing pun intended) that we wanted to pass along to you as well. In short, there seemed to be an overabundance of sugary foods available for our children. In a 24 hour period our church kids had jellybeans, desserts plus multiple sugary options at each meal, lollipops during play time, candy during the skit night, s’mores, and unlimited access to more jellybeans! Now contrary to possible popular opinion, the Sunukjian household is not a sugar-free, treat-less one that wrestles offending food from our children and force-feeds them tasteless rice cakes. We think treats can be one of many fun ways to celebrate special events and we choose them wisely and offer them in moderation. Why do we offer snacks and treats to our children in the first place? I believe it initially comes out of a heart for hospitality and celebration, but I think we’ve been influenced by our culture that food is mostly for our pleasure. God provides food primarily for nourishment and the beautiful symbolism of food in biblical celebrations has been watered down to far more “celebrations” with much less meaning and significance. Why do most snacks/treats involve so many bad ingredients and so few nourishing ones? What are some nourishing solutions that could still be enjoyed by the kids? Since we know that our kids will not be treat-deprived by the retreat center meals (loved the salad bar, by the way), perhaps we can focus on treats with protein and good fats, both of which help slow the digestion of sugar into the bloodstream. NUTS – Since we’re fortunate not to have any nut allergies that I’m aware of, those would be a good energy-providing midday snack. We could even greet kids with a bag of trail mix to go with the “woodsy retreat” theme. CHEESE – It’s a great source of fat and protein that most kids like. And if we forego the individually wrapped string cheese sticks, we could save money and landfill space by cutting chunks of cheese into bite size pieces. FRUIT – How did we make it through a fall weekend in Virginia without eating locally grown apples? Cutting up fruit is a quick, easy and healthy snack and we have great local and seasonal offerings in our Chesapeake Bay region. VEGGIES – They may be a harder sell, but a few interesting dips (ranch, cheese, nut butters, etc.) could make them more appealing. HOMEMADE TREATS – How about asking a few volunteers to make a dozen home-made cookies? It’s less expensive, less packaging, and I’ve yet to meet anyone who bakes with monosodium glutamate or red #5. Though some of these changes might be an adjustment for our kids, I think it’s just like any other issue that comes up while nurturing children. We need to gently guide them and give them opportunities to learn, experience, and make wise choices, rather than make decisions based on what feels (or tastes) good. Though Luke is not quite as zealous as I am, he is in full support of (and had editing rights to) this letter. We hope this “sugar manifesto” is taken in context with our love for and commitment to this church body. We send it prayerfully and thank you for your prayerful consideration. Love you guys. Please share how the Church is (or could be) engaging with food justice issues? This entry was posted in Build Good Health, Eat Real Food, Love Those Kids by Shesourceful. Bookmark the permalink. Ha ha! You are so right but with nut, berry, shellfish, dairy, braces friendly: ie no popcorn and glutten allergies providing healthy snacks that are kid friendly is challenging! So glad you are in charge of snacks next time. Let me know how I can help. Love this post. I have long wrestled with the concepts with environmental responsibility/nourishing our temples, and how the modern church doesn’t address these issues – rather the opposite! Thank you for being so direct and having the courage to speak your thoughts. Maybe you will help the rest of us similarly minded to share our own hearts in these areas. Great manifesto, Melanie, and said with such love that no one could take it too personally. 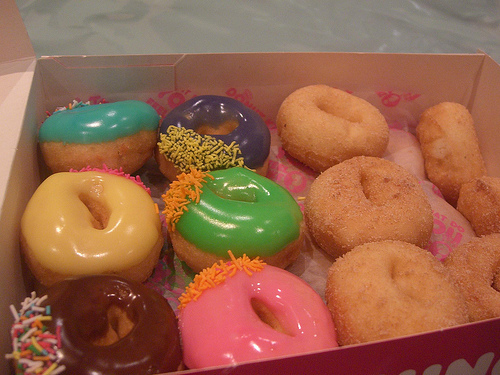 Oh, and the donuts in the photo look disgusting and delicious, all at once. You tease! I love this. 🙂 Especially the better snack suggestions (I need to get better at thinking of good snacks for myself! )… and the fact that you took over snack duty the next year! Hey, there, what a treat to enjoy your common-sense wisdom, packaged in humor and lightness, even though we are long distances from you, and even though you wrote that letter some time ago, it has a timely message. Thank you! Blessings on you and your dear ones. you’re amazing. eloquent and constructive, yet kind and gentle…can I hire you to voice may next complaint??? ?